The collapsing housing bubble started to take the economy down in early 2007. In August the credit markets turned turtle. Then the stock market entered a Debt Deflation Bear Market in December as the recession began. As 2008 opens, the Economy isn’t slowing it’s crashing. While many economic observers saw the storm clouds forming more than a year ago, our crack team of national economic policy makers only recently looked out the window, saw bad economic weather and sprang into action. God help us. Treasury Secretary Hank Paulson’s lame HOPE NOW mortgage bailout program launched October 2007 has not made a dent in the bad mortgage debt crisis. Bush and Congress now promise money drops in the form of income tax rebate legislation by March in a desperate attempt to restart consumer spending, but no checks will show up until June, more than six months into the recession. Bailing out consumers with income tax rebates fails to address the real problem, the highly regressive Inflation Tax that households are paying due to an inflation spiral ignited by years of dollar depreciation, ramping food and energy prices. New anti-recession policies designed to prevent a spike in unemployment in an election year will moderate the recession that started in Q4 2007 by adding fuel to the inflation fire. September last year, as the trees turned red here in the northeast and the Red Sox aimed to clinch the World Series, we warned readers in The Myth of the Slow Crash “Just because it's big, doesn't mean it can't go down fast. In a debt deflation extreme rate of change even fools central bankers.” Don’t expect this downturn to be a 2001 or early 1990s type recession or even, for you old timers who remember, like the more serious recessions the Volcker Fed induced between 1980 and 1983 with massive inflation fighting Fed Funds rate hikes. The US and the world are experiencing a rare debt deflation. It is both driven by and causing economic contraction as asset prices fall. It’s coming on fast and furious. Debt deflations follow periods of credit excess that created debt financed asset price inflation such as the US experienced in the 1920s and Japan in the 1980s. What happened next? A couple of charts below, familiar to frequent readers but fresh to newcomers, show what happened in Japan. US policy makers are well aware of the risks and are prepared to do just about anything to avoid a repeat of the error. Where is the Fed now? If you believe the CPI numbers, the Fed is already running a zero real Fed Funds rate as this chart shows from the St. Louis Fed’s latest report updated Jan. 20, 2008. As of November, the Fed was running real interest rates below zero. In January, two months later real rates may be as low as -1% as they were in 2003 and again in 2004. (It is unusual for the Fed to not provide the previous month's data.) This real rate does not even account for less generous calculations of inflation than the current CPI indicates, such as if pre-1983 methods are used. In that case, real rates might be -2% or lower. The Fed appears to be committed to maintaining zero or lower real interest rates, following an inflation target. Some of our subscribers decided to take the plunge and short the markets then using ETFs and index funds. So where are we now in the Debt Deflation Bear Market process? 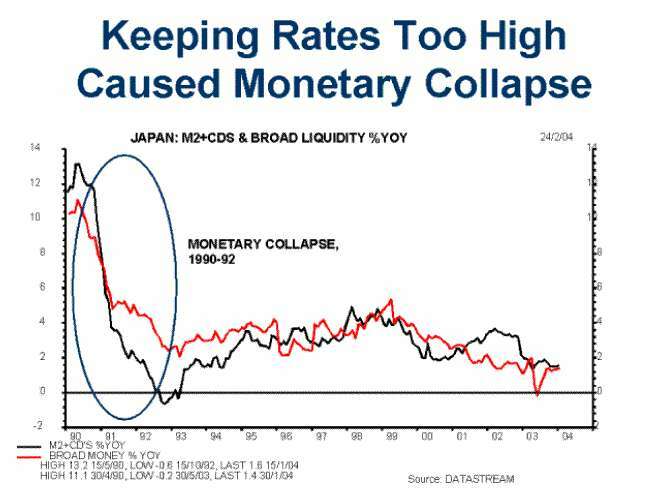 We are tracking it by comparing the US Debt Deflation Bear Market's development to Japan's. Each started at the end of fiscal years, 2007 for the US and 1989 for Japan. So far, so bad. At the time of this writing, the DJIA futures market is showing a 512 point drop tomorrow, so the market appears to be heading in the direction previously charted. 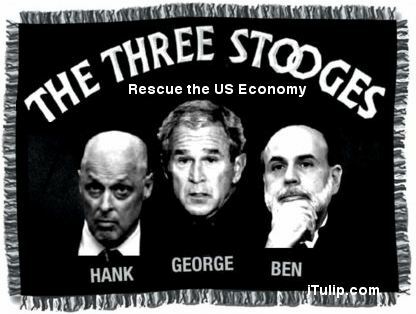 Good thing we got our crack economic policy team on the case. 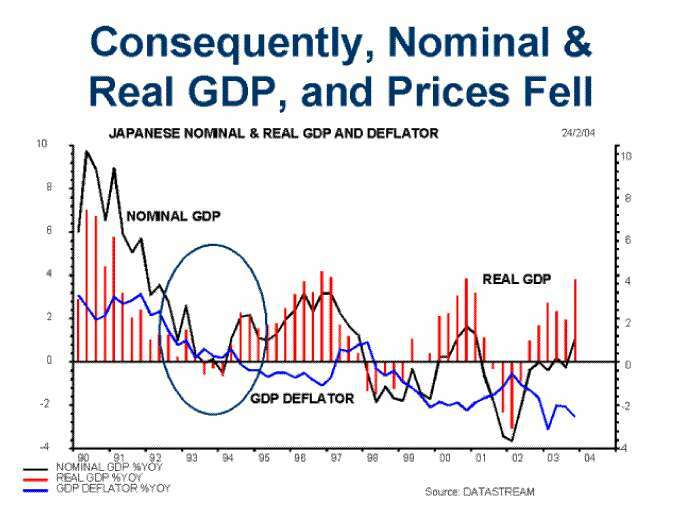 The mystery of how the Japanese managed to screw up the policy response to their debt deflation in its early stages may be starting to come into focus: institutional incompetence. 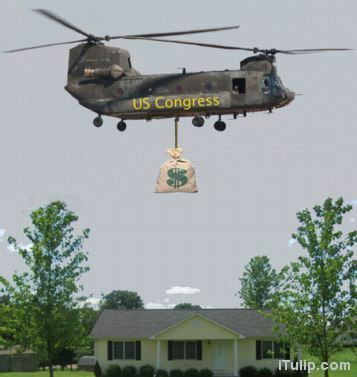 While Bernanke got the “helicopter Ben” label for promising to drop money in a pinch, let’s not forget who appropriates the money that the Fed drops. As the recession that started at the end of 2007 (see our Recession Forecast Contest to win a one quarter ounce gold coin if you can find a more accurate forecast than ours) becomes painfully obvious, politicians are in a race to see who can score the most points for doing the least in an election year to address real economic problems but instead prevent a spike in unemployment and a corresponding surge in the kind of “It’s the Economy, Stupid” voter sentiment that got Bill Clinton elected. Pity the financially pious who pray for a cleansing crash to teach the media doped masses to stop zoning out on home refinancing ads from Ditech or frothing at Jim Cramer’s self parody Mad Money show, designed to motivate impressionable young viewers to churn their portfolios for fun and profit–Wall Street’s fun and profit, that is. Learn from ye evil ways, pilgrim! Take your medicine, Wall Street! Time to pay the piper is here but that daredevil monetarist economic policy inevitably gives way to milquetoast Keynesian bailouts every time the economy tries to shed a few trillion dollars worth of bad debt accumulated during the previous party. We felt compelled by generous impulses to bust the myth of the purifying economic calamity in Recession without Romance. The System is not designed to purify credit addicted lost souls or soulless bankers through poverty and perdition, and if a soup line forming and mass bank failure inducing economic debacle did occur the primary victims–as usual and in the current instance of historically unprecedented distribution of wealth, more than usual–will be the middle class on down the economic prosperity ladder. This group has hardly any liquid assets net of what’s put aside to cover the housing bubble bloated mortgage and refinancing payments on the rapidly depreciating homestead. According to analyst Frederick Cannon of Keefe, Bruyette & Woods, “At least $14.7 billion in loans and lines of credit were already delinquent through the end of September, the highest level in a decade. "After subprime, home-equity lending is the biggest problem the industry has right now.” With millions of households fragile from a decade of excessive borrowing and thousands of businesses levered up on debt from the LBO boom, the US economy is better poised for a 50 foot swan dive into a dirt pit than at any time in the last 70 years. (You remember the LBO boom, right? It was the nearly daily announcements of multi-billion dollar buyouts that suddenly stopped last summer. Here’s an idea for a new web site: Forgotten Financial News. If you create it, don’t forget to feature Jim Cramer. He’s busy now recasting himself as a champion for the little guy who warned about the bear market, again.) Thus it is the majority, the great mass of voters, who in our great republic are carefully managed during a recession, especially in an election year. Recent economic rescue proposals are getting hammered through the political process even before a single month of economic contraction has been officially acknowledged by the Bureau of Labored Statistics. Economic stimulus proposals are zeroing in on a $800 and $1,600 tax rebate check, the former for singles and the latter for married households, and the debate over whether they will “work” or not was carried in the financial press this weekend. We call it the Inflation Tax Abatement Check because it might just about cover last year’s inflation costs for the average recipient. For example, the DOE and DOT say an American car is driven between 10,684 and 14,050 miles a year depending on income and gets an average of 24 MPG. The average price of a gallon of regular gas a year ago was $2.27 versus $3.11 today. The average car owner who earns less than $30,000 a year will spend about $375 more this year than last year just on gasoline, or 45% of the $800 check Congress plans to send to save the day, while the car owner who makes more than $100,000 will spend $492 more. Sum the higher costs of energy, food, utilities, insurance, and tuition and that little $800 check is already spent by inflation. Inflation is a regressive tax. Just ask my friend Gary. We were speaking on the phone the other day. He is worried about the recession and agrees with me that we’re in for a couple of tough years. He hopes I’m right about a Next Bubble in alternative energy and infrastructure arriving to save our economy. As we spoke he cruised in a limo on his way to Handscom Air Force Base in Bedford, Massachusetts, a stone’s throw from our offices, to catch a private jet to Vail for a ski vacation. The inflation tax doesn’t matter that much to Gary; gasoline, not to mention jet fuel, are a rounding error in the calculation of the total cost of this vacation. But they do matter to the median household in the US with its $46,000 in liquid net worth that is also trying to figure out how to pay the mortgage, health care, college, food, and heating bills. In the graph above, whether you earn less than $30,000 or more than $300,000, you spend about the same on gasoline, but at $30,000 a year an extra $375 is close to 2% of your entire after tax income. Steve Scher interviews Eric Janszen on KUOW public radio in Seattle on Tuesday, January 22 at 9:20AM to 10:00AM Pacific. Weekday is a daily two hour public affairs program. Host Steve Scher, Producer Katy Sewall and Producer David Hyde track trends in society and culture. Weekday brings newsmakers, commentators and listeners together to explore the stories behind the news headlines. Listen to the interview here in MP3 and here in RealAudio. The tax that Congress doesn’t want to talk about, the one that’s really killing Americans, is the Inflation Tax, but it’s a tax that mostly hits the poor and middle class and Congress long ago gave up caring about them. Ben Bernanke made it clear in testimony before Congress last week that an inflation tax cut is out of the question during the early phases of what he knows full well is a debt deflation. The contest is on. Which party can drop the most money onto your house before November, the borrow and spend Republicrats or the spend and borrow Democrans? Ongoing behaviorally engineered complacency is key to maintaining an economic structure that "both" parties are pretty pleased to see go on forever. Until it blows up, that is. Which it has–they just don’t know it yet. In Part II for iTulip Select subscribers, we discuss the implications of reflation policies–dollar depreciation, rate cuts, rebates, deficit spending, and others–when the dollar is already weak and inflation is already running at a 26 year high. 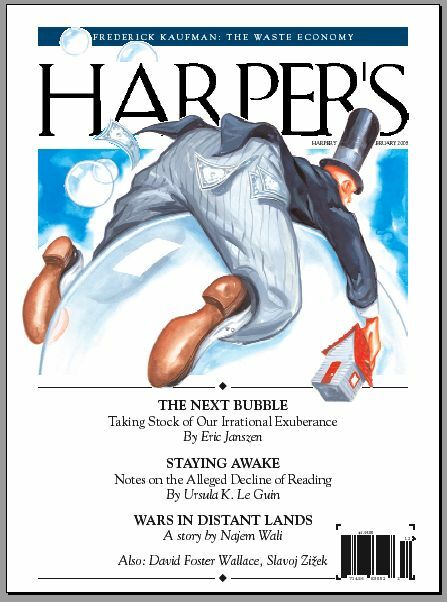 To learn about the Next Bubble, sign up for one year of iTulip Select by January 15 and receive the February 2007 issue of Harper's Magazine with Eric Janszen's cover article The Next Bubble free. Last edited by FRED; 01-23-08 at 07:25 PM.